RANGELY | Panther football started the season with a decisive win over the Norwood Mavericks, a non-conference opponent. Leading from start to finish, the scoreboard read 26 to 12 as the last second ticked off the clock. The seniors still had a bitter taste in their mouth from their last meeting in 2015 when Norwood showed little mercy and the Panthers made sure the Mavericks knew there was a new sheriff in town. Rangely’s first score came in the first quarter as Tytus Coombs ran 30 yards on the outside for a touchdown. The conversion failed, Rangely 6-0. Just into the second quarter, quarterback Drew Brannan connected with Trenton Files on a 27-yard pass for six points. The conversion failed, Rangely 12-0. With five minutes to go, Norwood, Tyler Wytulka found Will Gabriel open down field for a 40-yard completion and six points. The conversion failed, Rangely 12-6. With under a minute to go, Wytulka completed a 20-yard toss to Austin Overholt for a score. The conversion failed and the score was notched up at 12-12. With the clock running down, Rangely moved the football down the field and Brannan found CJ Lucero in the end zone for 6. Coombs carried the ball in for the two-point conversion and the Panthers were up 20-12 at the half. The next and last score of the game came near the end of the third quarter as Coombs scooted in from a yard out for his third score of the game. The conversion failed and Rangely had the lead 26-12. Both teams tightened up the defense and the final score was 26-12. 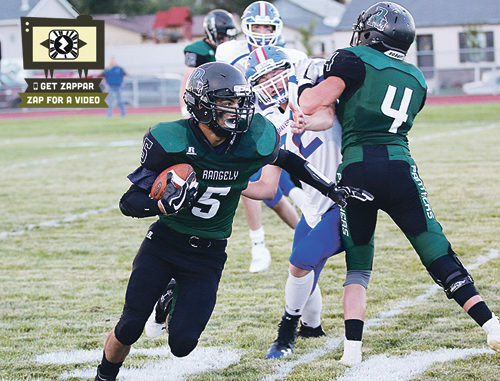 Rangely’s next game will be an away non-conference matchup in Dove Creek on Friday, Aug. 31 at 7 p.m.
Rangely plays in the A-8 Northwest (8-man) conference with West Grand, Soroco, Gilpin County, Plateau Valley, Hayden and Vail Christian. West Grand is 1-0 with a 43-0 win over Calhan this weekend. Soroco is 1-0 as well and won their first game over South Park 60-38. Gilpin County and Plateau lost their first games and Hayden and Vail Christian begin their season next week.